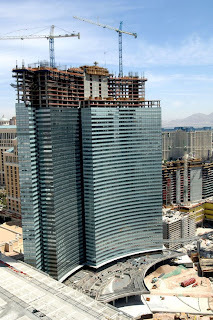 I had the opportunity to visit the sales center of the impressive new CityCenter complex in Las Vegas recently, and the whole project is pretty amazing, even for Vegas. • 400-room The Harmon Hotel, Spa & Residences. Amazingly, seven architects and 90 interior designers are contributing to the CityCenter project. And although such an enormous building project doesn't sound like it would be synonomous with being green, I found that an environmentally conscious air permeated everything about the construction, the rooms, the whole operation. Constructing an environmentally sustainable property was important to MGM Mirage & Dubai World. According to Gail Fitzgerald, vice president of Hotel Sales & Marketing, “We need to go vertical, we live in the desert.” She maintains that building taller structures on acreages similar to what the nearby Bellagio or Caesers resorts encompass is one way to be greener than in Vegas’ past. Sort of an aside, but found this rumor that a huge Apple store will be going in the shopping portion of this complex.